Liverpool battered Swansea 5-0 at Anfield, helped by two goals from Roberto Firmino, while Alex Oxlade-Chamberlain, Philippe Coutinho and Trent Alexander-Arnold also scored. It was a ruthless performance from the Reds, who were helped by an uninspiring Swansea display, who remain bottom of the Premier League. Liverpool broke the deadlock just six minutes into the game, as Coutinho scored a delightful goal from outside the box. Jordan Ayew was dispossessed in midfield, before the ball found its way to the Brazilian forward, who gloriously bent the ball past Lukasz Fabianski. Liverpool’s trio of attacking stars were combining ferociously in the early stages, with Firmino and Coutinho getting in behind the defence. As the game progressed and Liverpool failed to add to their one goal lead, the Anfield faithful became increasingly restless. Misplaced passes were met by a series of groans as a struggling Swansea side tried to find their feet. 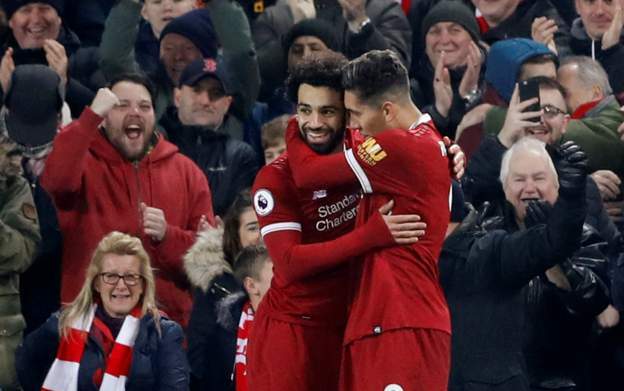 Firmino and Mohamed Salah both missed good opportunities for Liverpool, whose complacency after going 1-0 up is becoming a trend – Everton found a way back into the match having been dominated all game, while Chelsea were also able to draw 1-1 having trailed the Reds. Swansea’s centre-backs, Alfie Mawson and Federico Fernandez, were competently dealing with an attacking force which most teams in the league have struggled with this season, though referee Kevin Friend had to wave away a penalty claim against Salah just before the interval. Once they’d fallen behind, Swansea’s problem was always likely to be in attack. Oli McBurnie, starting his first Premier League game, worked hard, but found himself isolated throughout the first half. In spite of all their attacking woes, Swansea were very much in the game at half-time, going in at the break trailing by just one goal. 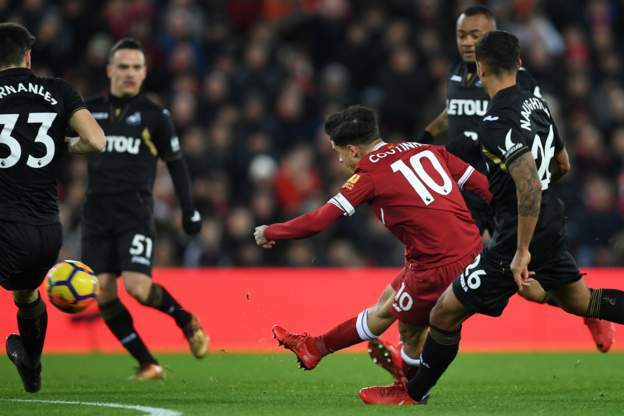 Liverpool began the second half in similar fashion to the first, after Roberto Firmino volleyed home from Coutinho’s free kick. Firmino’s strike killed the game off – Swansea had only scored twice away from home once all season (against Crystal Palace in August). Much has been made of Jurgen Klopp’s urgency to rotate his attacking force, but Firmino has been a mainstay in the Liverpool line-up, having started 19 of 20 Premier League games this season. His selfless defensive work, coupled with an intelligent football brain, means he is the perfect foil to the Reds’ attacking riches. Trent Alexander-Arnold added to Swansea’s troubles just after the hour mark with a fantastic strike which rebounded into the net off the crossbar, while Firmino tapped in his second just minutes later to make the score 4-0. Britton rolled the dice, bringing on castigated midfielder Renato Sanches, but the game was long-gone. In truth, Liverpool won the game when they scored their first goal, such are Swansea’s attacking problems. Alex Oxlade-Chamberlain doesn’t score enough goals, as Jurgen Klopp has said, but the England midfielder put his name on the score sheet with a volleyed finish in front of the Kop. Liverpool were clinical against the worst team in the league, and their ability to destroy the sides towards the lower end of the table is an ominous sign for their competitors. Chairman Huw Jenkins has to appoint a new manager in the near future, so imperative is the January transfer window. The board’s thinking is so scrambled at the moment – they stuck with Paul Clement through testing times in the hope he could re-strengthen in January, but sacked him when his side’s performances looked as if they were improving. Swansea won’t be relegated because they lost at Anfield, and nor will Liverpool get a top four place because they beat Swansea, but it was a performance from the Welsh side which highlighted all their issues. The midfielders can’t pass, the wingers can’t create and the strikers can’t finish. You’ll struggle to stay in the Premier League with that.